Researched reports and heritage statements which satisfy planners and conservation officers. Consultation visits to offer advice on the plaster works which you plan to do. 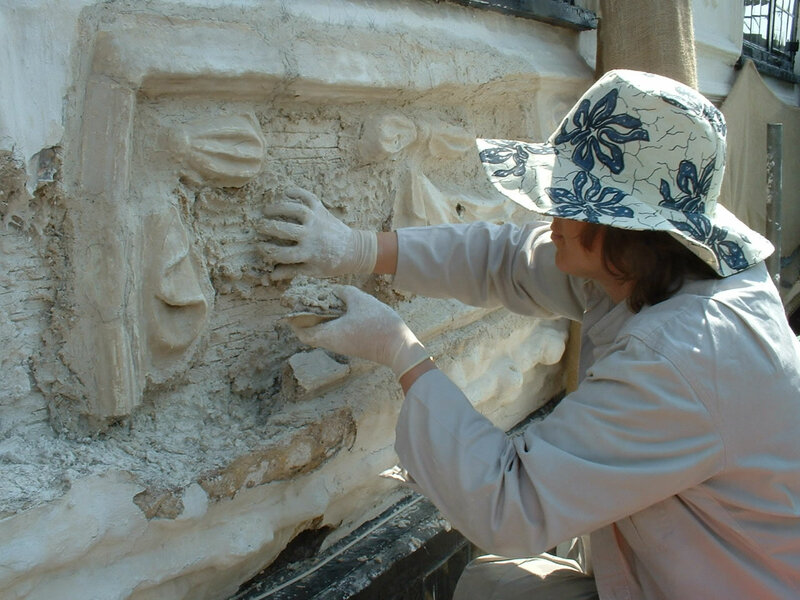 Hands on conservation and restoration of ornamental and historically important plasterwork. I would argue that if any building is historically important then so is the plaster on the walls and ceiling. Old plaster will not be flat, it may be a bit tatty but it oozes old character and age. I have often seen beautiful old timber framed houses which have been restored with great love and expense. But the owner has effectively end up with a brand new house containing some lovely old beams and other timbers, because the value in keeping old plaster is not recognised even by architects and conservation officers. Is there any problem if a ceiling is bowed or a wall bulges? what is just modern tat and of no interest at all! Over the years, several different materials have been used for plastering walls and ceilings. At the bottom of the scale, poor people used mud or clay, which of course was cheap and readily available. It works remarkably well so long as it does not get wet. So outdoors it was normally sat on a foot of stones and given a hat of thatch or tile. If a little more money was available, then it would be painted with limewash and this thin coat of lime helped to protect it from the weather, make it a nice white colour and give the wall a slightly antiseptic surface. To maintain this surface it needed to be re-limewashed regularly, perhaps every one to five years. Until about 1500, in a typical farmhouse there was a fire in a hearth in the middle of the floor and smoke wafted throughout the house. There was no advantage in painting the walls white so a finely sieved mud finish was often used on, perhaps with painted decoration. In Tudor times the fire was moved to a hearth at the base of a chimney stack and with smoke now contained, the new fashion was to plaster the walls and ceiling with lime plaster and bright white limewash. Lime plaster is made usually made from chalk or limestone, whichever is available locally. It was heated in a kiln to make the horribly caustic quicklime (handy for dissolving murdered bodies). Either it was mixed with sand and water and used immediately for plastering. This is called hotlime and in recent years there is a new appreciation of the advantage of this technique especially in extreme climates. To find more information look at the journals of the Building Limes Forum https://www.buildinglimesforum.org.uk/. Or the quicklime was rested underwater for some days or years before being used. This allows a chemical reaction time to occur which makes a lovely material called lime putty. 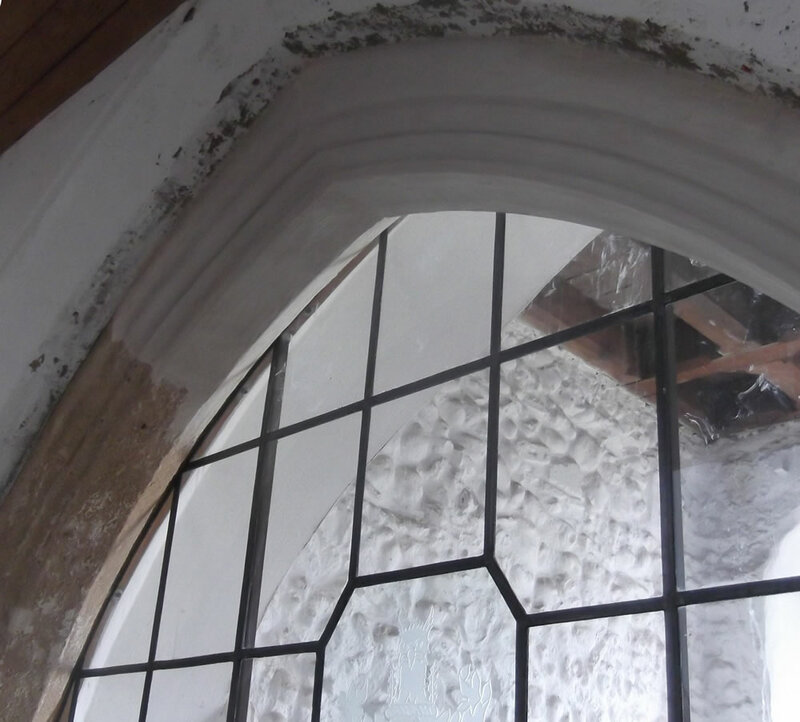 Which is a bit like clay in consistency and is ideal for mixing with chalk or sand and hair to make lime plaster, or for mixing with water to make limewash. Other materials which have been used for plastering are gypsum and cement. 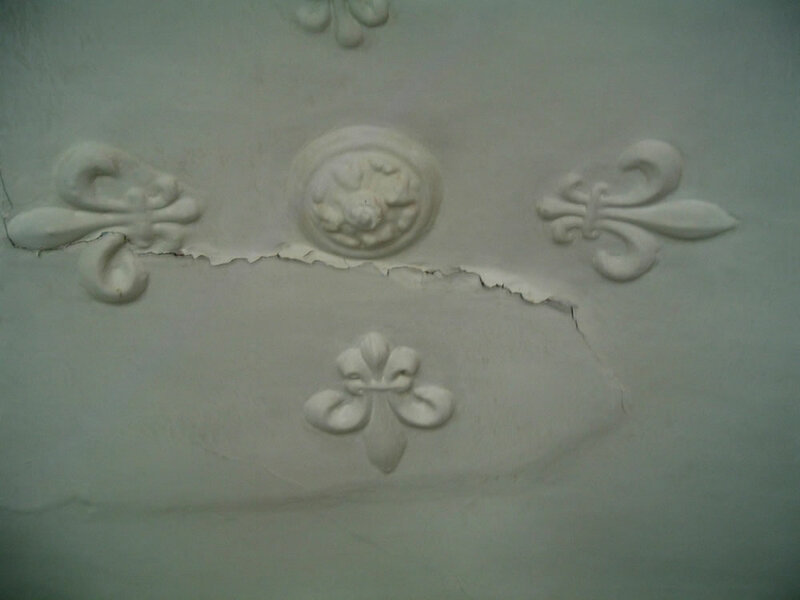 Cast gypsum ornaments have been used for plaster ceiling roses and fine filigree ceiling ornaments since about 1860. Cement render has been increasingly used for outdoor work since about 1900 and gypsum plaster for covering flat walls and ceilings indoors since about 1945. Cement render and gypsum plaster have advantages – they are quick setting and labour costs are cheaper – and they are fine on new buildings with proper damp courses which have been designed with these products in mind. However, before about 1900 buildings were designed for lime plaster on both internal and external walls. 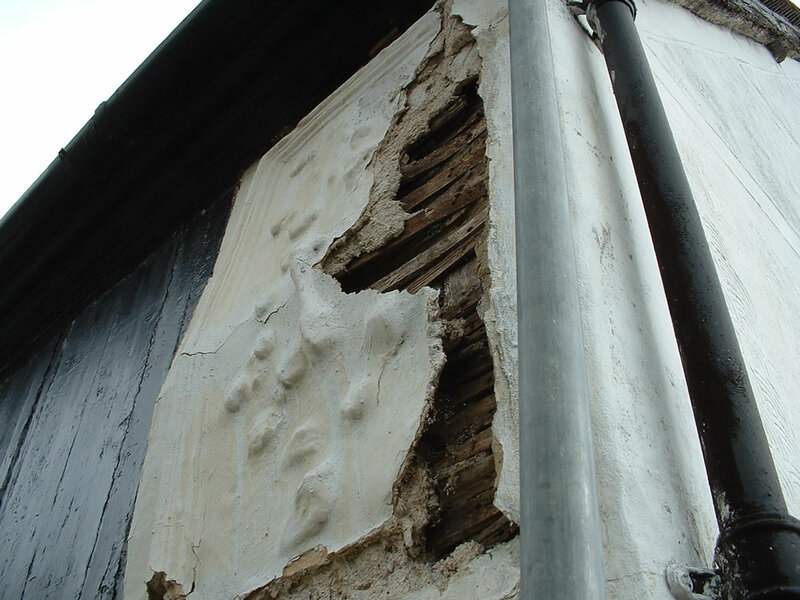 Using modern materials instead of lime plaster risks getting moisture trapped which will cause condensation, rot timber and can eventually cause catastrophic failures. This is not well understood by the typical builder, who has probably never used lime plaster. Hey ho! My timber framer colleagues and I are kept busy repairing past damage.